President Danko delivers his seventh State of the University address. Photo by Jimmy Lafakis. LaVall Jordan, men’s head basketball coach, glanced between the audience and backstage before reaching the podium. He told the audience he was looking for the line to get his homecoming parking pass because he almost got a ticket earlier in the morning. The audience that had gathered for President James Danko’s state of the university address in the Schrott Center laughed. 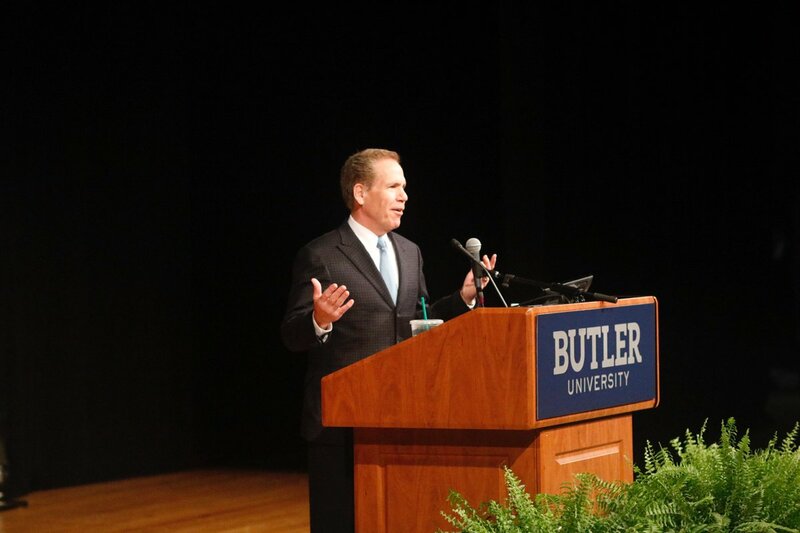 On Friday Oct. 20, Danko delivered his annual update on Butler University. In the speech, he covered a variety of topics and included multiple guest speakers. Jordan was among these guest speakers. The new men’s head basketball coach was the first to appear on stage and introduced Danko to the audience of faculty, alumni, staff and students. “[President Danko] has been a tremendous resource, not only with all the things he’s done since the time I’ve left Butler until now, but he’s also got some really good late game plays to get Kelan Martin good shots,” Jordan joked. Danko came onto the stage and thanked Jordan for his introduction. Danko spoke about the university’s financial situation, stating that the financial results from this past year were the best in Butler’s history. Regardless, he was still concerned for the financial situation in the future and tuition levels for students. Danko said that every year when the discussion of tuition comes up, the university does everything it can to keep it low for students. But they cannot go too low or else they would have to halt construction or freeze compensation for faculty members. SGA President and senior political science major Jimmy Lardin said like many Butler students, he shares the frustrations about high tuition costs; however, he also thinks the money goes toward bettering the university. “We have to be cognizant that our tuition might be limiting our goals of diversity and inclusion, but I also recognize that the cost of living in Indianapolis goes up, so how are you going to pay your professors on the same wage that they got 10 years ago?” Lardin said. On the topic of faculty compensation, Danko said the university has been analyzing the amount they pay their faculty members compared to peer universities so that they can get it right. He said the research is almost complete. Danko also addressed the level of diversity on Butler’s campus. Senior psychology major Tony Trimpe said he is happy that Danko is working toward diversity. Danko finished his speech by urging the Butler community to focus on self-reflection and improvement every day by asking two questions. Danko proceeded to list some of Butler’s accomplishments from the previous year, including ranking second among Midwest universities and most innovative school in the midwest by the U.S. News and World Report. He also said Butler was “among the best in the nation” for internships, study abroad, first year experience and undergraduate research. Among these concrete distinctions, Danko spoke on the quality of education that he hopes Butler provides to its students. “Most importantly, we remain committed than ever to providing an exceptional academic experience, one that inspires achievement, growth and a love of learning in our students,” Danko said. Trimpe said he thinks there is always room for improvement when it comes to academics. Danko then addressed the progress of Butler’s 2020 vision, including the construction of Irvington House, the new business building and a new addition to Holcomb and Gallahue Hall that will connect the two buildings. First-year exploratory student Isabelle Beeker said she is not a fan of the construction, but understands the need for the end result. Lardin said students have a voice in the way that the university spends money, builds and makes decisions. Lardin said the student senate is a valuable but underused resource. Danko later noted that Butler’s rise in applicants to 15,000 last year seems to imply that people are becoming more and more aware of the university’s prowess. He announced that last year’s incoming class had an average high school GPA of 3.83. From there, Danko took a moment to recognize different projects happening around campus. He spoke about MJ Student-run Insurance company, LTD. in the Lacy School of Business, the new statistics major and the focus on undergraduate research in the College of Liberal Arts and Sciences, the student-run health care journal in the College of Pharmacy and Health Sciences, and Jordan College of the Arts working with the Butler community arts school. Junior statistics major, Abigale Wynn, said the addition marks an improvement within the university. Danko returned to the stage and praised the Butler team that won the annual Parrish Library Case Competition at Purdue University. He also announced that Butler’s graduate job placement is at 97 percent after last year. Next, he addressed Butler Athletics’ achievements in the last year including Butler men’s soccer and men’s tennis winning their respective Big East Championships. He recognized Butler soccer’s David Goldsmith for winning last year’s Big East Scholar Athlete award and men’s basketball for making the sweet sixteen last March. Norman Wilkens is a Butler graduate from the class of ‘57 and was in attendance for the address. He said he is happy with what Danko has done in his time at Butler. Danko’s first guest speaker was Shelly Furuness, an associate professor for the College of Education. Furuness recognized the alumni in the room and confirmed that despite the physical changes to campus that they were still at Butler. Next, Furuness announced the COE continued their over-a-decade-long streak of seeing 100 percent placement of graduates from their college. She also spoke about the One Butler project that was launched last year with The Brain Project. Nick Huang, senior finance and marketing major and SGA member, was the second guest speaker. Huang told a story about his internship in Hong Kong and said that he never imagined his college career to be what it has been. “What makes Butler special is it’s creation of opportunities that force students to look inward on themselves, not outward at the world,” Huang said. Huang finished his speech by challenging the audience and the university as a whole to commit to diversity, confront problems with mental health, practice “unwavering inclusivity,” as well as political awareness and to bridge the divide between Greek and independent students. Lardin said that while there is always room for improvement, groups on campus like the Diversity and Inclusion Board can help to confront those issues. The board of trustees and the new Title IX investigator have been working to make steps toward recognizing and helping people in the Butler community who have problems with mental health. Abigale Wynn, junior statistics major, thinks that the divide between Greek and independent students can be seen in involvement. “As far as going to things that happen on campus and taking advantage of those opportunities, that is not pushed to [independent students] as much as I have seen elsewhere,” Wynn said. The last guest speaker was Dr. Michael Hole of Butler’s class of ‘08. Hole recently was placed on the Forbes’ “30 Under 30” list of the most promising and influential young people in the country. His work is focused on child poverty. Hole is a cofounder of StreetCred, an organization that helps low-income families in Boston save time and money. Wynn said that Hole’s success does not shock her in the slightest. Hole spoke about the travel abroad experience during his first year at Butler, where he worked as an intern in a makeshift medical clinic, that allowed him to see child poverty for the first time. He said he has been working to help solve the problem of child poverty for the last decade. Lardin said that he hopes stories like Hole’s are foreshadowing the success that he and his classmates could have in the future after graduating. Hole ended his speech by challenging the audience. Wynn thinks that this idea of helping others in need to make the world a better place is something to live by. Danko had nothing but praise for his guest speakers and said they were ideal Butler products. “If I was to just put out there simply what the mission and the vision of this university would be, it is that every year we graduate 1,100 people like Shelly and Nick and Mike,” Danko said. This was President Danko’s seventh annual state of the university address.